Dixon, Dougal. The New Dinosaurs: An Alternate Evolution . Salem House 1988. What if: The KT Great Extinction never happened, and dinosaurs survived to the present day. Summary: Pictorial biology of the modern result of continued dinosaur evolution. Published: Grafton 1988 (0246132590); Salem House 1988 (0881623016w88 android); SFBC 1988; Fawcett 1989 (0449904423BUY). 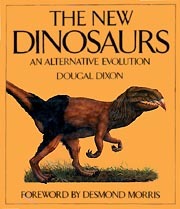 Translation: French by Stan Barets as Les Nouveaux dinosaures: l'autre évolution , Glenat 1989 (2723411680).